Significantly, Phantom was the only station to increase Weekly Reach* during the survey period and with continued growth the first six months of this year**. iPhone owners can now produce DJ mixes straight from the phone, with the latest handy piece of software. We’ve come a long way from the old days, when the tools of the trade were a set of record decks, and for editing, a couple of reel to reel recorders and a stack of razorblades. I could never master the blades myself. On the rare occasions when I was called on to edit music – for advert beds, or to cobble together a longer version of a song from truncated snatches grabbed from some chatshow, I always knew exactly what I wanted in terms of what the final edit should sound like. But I never had the dexterity, or the patience, to get it. Editing was fiddly, lots of cutting and splicing tape. Out on Caroline, we had the added problem that the razorblades would quickly go rusty in the damp salty atmosphere, and it simply wasn’t possible to just pop down the shop to get more. Peter Philips, who was Programme Controller when I first joined Caroline was a man of many talents – presenter, manager, mast-climber, and master editor. He could and would happily spend hours in the back studio working to get the perfect edit. I recall one occasion when, due to lack of new record supplies, we were resorting to grabbing new material from the ITV Chart Show. Frequently they only played segments of records, and in this particular instance they ran about 1 minute 42 seconds of a new Level 42 song that we needed. Peter disappeared off into the production studio, and emerged some hours later with a version of the song that ran to just over four and a half minutes. You could not hear the joins, it didn’t seem to repeat itself, and we could never quite work out how he had done it. In fact, so good were his efforts, that when we eventually got the proper vinyl version, it not only turned out to be a full minute shorter, but also not nearly as good as we had thought it would be, and so we kept playing the Caroline version! Of course, we would have killed for the kind of technology available these days, which allows even impatient and cack-handed people like me to produce decent edits with no tears, and not a razor blade in sight. With all the best tools in the world though, I still couldn’t make a four and a half minute pop song out of a 90 second clip, so my admiration of Peter’s skills as editor still stands. 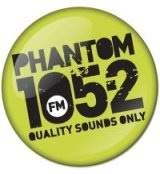 I’m filling in on Bedrock (2200-0100) on Phantom 105.2 this evening (Mon 4th August 2008). There’s nothing quite like late night broadcasting. Over the years, on Phantom and Caroline I’ve been in just about every slot at every time of day, but there is nothing that gets my pulse racing quite like the chance to be on around midnight. It’s more personal, the colours drawn by the music more vivid, or at least that’s how it feels to me. And Bedrock is a great show, with new and classic rock up to midnight, and a more atmospheric, intense hour from midnight to one. Any other job, any other employer who wanted me to come in and do extra hours up to 1am would not be greeted with the same sense of excitement. Some people will tell you that part-time, fill in work on radio is a tough and sometimes soul-destroying business. But I just feel lucky.